When you think about what we put our feet through every day, it’s no wonder they get tired and grumpy! Our feet are literally the foundation we depend on to support us as we go about our activities; hobbies, sports, work – all depend on healthy feet to take us where we need to be and then to bring us home. This clinic takes an upclose and detailed anatomical look at our too often neglected feet. You’ll see the intricate and amazing structure of the foot, and understand why foot health is so important and what we can do to promote it. 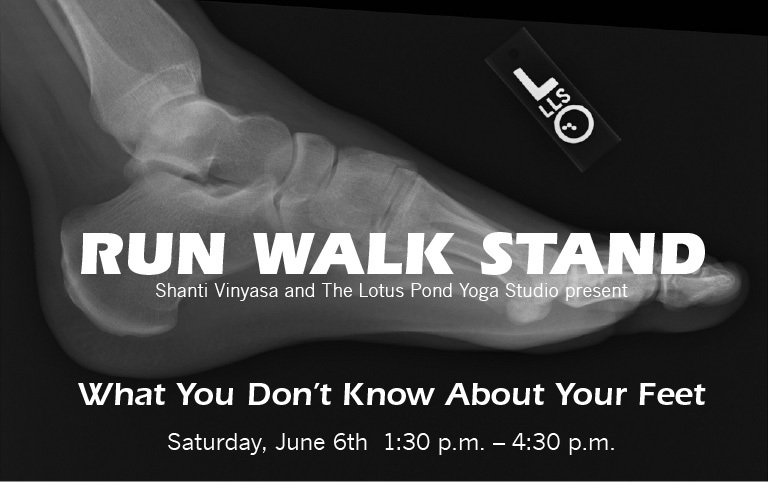 Join Shanti Vinyasa’s Nancy MacDonald when she presents a fun, informative, and unique look at our feet; how they’re made, how they work, and most importantly how to keep them happily walking and at their healthiest! Teachers can earn 3 CEUs while learning about the foot’s unique anatomy as Nancy draws on her comprehensive knowledge of skeletal structure and biomechanics in this one-day, three-hour class. Correct anatomical alignment for the feet, on and off the mat. How misalignment of the feet can cause students to struggle in yoga postures. Suggestions for students dealing with bunions or plantar fasciitis. Healthy foot exercises you can perform anywhere to build strength and regain flexibility. Ligaments, tendons, and muscles! Oh my! How our shoes affect the feet, knees, hip health, and overall posture. The most important stretch you can do for foot, knee, and hip health. With over 2,000 hours of training, Nancy shares her in-depth knowledge of anatomy, and how understanding the mechanics of movement can restore vibrancy and health to your and your students feet. This anatomy and practicum workshop is primarily designed for yoga teachers but students of all levels will gain insight and understanding through the unique techniques taught. Signup at The Lotus Pond Yoga Studio now. This class will fill up quickly. Toe stretch, toe balance, 10 churnings, breath of joy. Sun salutation with 1/2 Hanuman, Parsvotanasana, swan, archer, warrior 1, chair. Balance tree to eagle to dancer. Standing strength to back strength, forward folds and twists. Few cat rolls and toe stretch, opening the hands with stretches. Standing and opening the feet with a golf ball really feeling the areas that are tender. Moving through some flows that have strength building in them with cat bows. Hip openers, standing postures including 1/2 moon, pigeon, double pigeon, 1/2 lord of the fishes, janu sirsasana. Toes stretch with toe balance, Ten churnings, breath of joy. Sun Salutation with 1/2 Hanuman, Parsvotanasan. Balance tightrope balance to standing padangusthasana with a twist. Standing strength with 1/2 moon. Swan to 1/2 lord of fishes, opening into twist, firelog stack forward fold and walk side to side, janu sirsasana. Pranayama over 2 blocks to open up the chest. Starting by warming up the abs in a supine position, rolling up to a Navasana flow. Slow and mindful Sun Salutation. Moving into hip openers with Skanda before the standing postures. Balance blend of a moving balance. Toe balance to the floor for a cobra flow to strengthen the back, forward folds and twists to wring out anything that no longer serves you. Aromatherapy tonight is Shanti Blend from Yoga Flow Oils, thank you Susan. Hip rolls, cat rolls, fire hydrant rolls, nose to knee balance. Toe stretch to toe balance. Standing forward fold, runner to crescent runner, 1/2 Hanuman, downward facing dog, warrior 1,pyramid, revolved triangle. Simple balance of just coming up onto toes, then adding arms in, tightrope balance up on toes. Forward fold, squat, forward fold building strength in the legs and buttocks. Twist and forward folds to round everything out before aromatherapy and Savasana. After doing twists and forward folds last week I thought we would focus on the hamstring tonight. Using a golfball tonight to start. Pressing the sole of the foot to the ball and rolling it around finding the tender or tight areas of the foot. This not only opens the foot but the muscles in the legs and hips as well. Doing one side then observing the difference between feet, legs, hips. Repeating on the other side. Forward fold by bending the legs and bringing the chest to the thighs then lift the sitting bones but keep the ribs and thighs together. Warming up the legs with variations of sun salutation and learning to step forward using the correct alignment stacking the bones and using the muscles correctly to build strength and stability. Stretching out the hamstrings on the floor with a strap. Working on balance tonight, from low on the knees to standing. Cat rolls, extended cat rolls, kneeling opposite arm and leg, reverse table with one leg lifted or in cradle add dips. Toe stretch to toe balance to stand. Reed, reed with elbows wide feeling the opening of the side body. Forward folds to lunge to crescent lunge, step forward to hand to knee and holding the knee fold forward, float back up and into twisted hand to knee or foot pose. Lunge, vinyasa and other side. Lunge, chair up on toes to standing still up on toes to sink back into deep chair. Half moon and arching half moon, wide leg forward fold adding twist, toe balance or crow. Cat, toe stretch, cowface and folding over the legs, cobbler or tarasana. Aromatherapy and Savasana. Aromatherapy tonight will be Relaxing Blend from Yoga Flow Oils, thank you Susan. Sun Salutations, warrior 1, with a balance twist, warrior 3, standing split, Skanda, warrior 2, side angle, triangle, triangle, Skanda. Bird of Paradise, & Dancing Shiva for Balance. Hip openers to release the hips, core strength with the can can, opposing muscles of the back with dolphin/plank, cobra boat flow, finishing with twists & forward folds. Aromatherapy and Savasana to send you off for your day and weekend. Subbing for Gina tonight so we will break out the balance to flow into the weekend. Pranayama: Sahaja, Dirgha with Ujjayi. Cat rolls, cobra/child flow, Anatasana flow, table balance, rocking lunges with a thigh stretch. Gentle Sun Salutation. Cross leg forward fold, chair with added kicks for balance, Warrior 1 flow to pyramid flow down to standing yoga splits. Standing wide angle forward fold with twists. Standing 1 leg balance to toe squat to crow. Cobbler, Marichiasana twist, aromatherapy down to floor for frog leg stretch, happy baby and twist before Savasana. Aromatherapy tonight will be Ananda Blend from Yoga Flow oils. Thank you Susan.